For a modestly-sized city in one of the nation’s smallest statea, Burlington, Vermont has a surprisingly good selection of restaurants, enough that we always have a bit of trouble figuring out which place to go. One of the perennial contenders for a dinner in Burlington is a smallish place on Bank Street a bit away from the hustle of the Church Street Marketplace: A Single Pebble. A Single Pebble is one of those places that inhabits a semi-funky space, in what used to be a strip of houses in a block now surrounded by the Burlington Center Mall, Church Street, and a parking garage. If you didn’t know the place was here, you might never stumble upon it, but it’s a reasonably sized restaurant that occupies what used to be two houses and the yard between then (since built over), and most of the seating areas still vaguely resemble their old purpose (indeed, this visit’s seating was in what was obviously the original dining room of one of the houses). The staff at A Single Pebble is definitely trained to be friendly and explain the dishes, and they always seem excited to tell me about the current specials, and explain unfamiliar dishes on the menu. Menu-wise, I’d place A Single Pebble someplace between a good American-style Chinese restaurant and some of the more authentic places I’ve been in NYC and San Francisco: the focus at A Single Pebble is primarily on traditional Chinese and Taiwanese dishes, with a lot of the specials playing around with more modern interpretations of these dishes (with non-Chinese spices or more western preparation techniques). 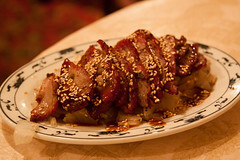 The result is a combination of classic dishes done well and a little bit of playfulness. This time, while I was again tempted by the Chef’s Tasting Menu of 8 course, we opted to stay lighter and do fairly traditional, with an order of hanging pork, and two entrees, one of Sha Cha Beef and one of Three Cup Chicken. The hanging pork was the first to arrive (one quirk I’ve noticed on previous visits to A Single Pebble is that they seem to put your entire meal ticket in at one time, and all the items come out immediately as fired, so your dishes have a tendency to arrive in random order), and this was a great start to the meal. 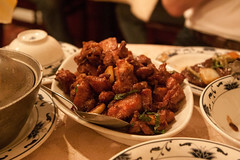 A reasonable generous portion of tender pork marinated in a five spice sauce, this had everything I look for in a “Chinese Barbecue” dish: the pork was perfectly tender and not overcooked, the sauce was spicy and tangy, sticking to the outside of the pork in a perfectly crispy crust. The pork was served on a bed of tender greens that were good in their own right, but also a good vehicle for chasing down leftover bits of the five spice sauce. This was one of those dishes that will inspire me to attempt a recreation at home. Next arriving was the Sha Cha Beef, which is basically marinated beef in a rich savory sauce served in a warmed steel pot over wide rice noodles. This is one of those dished where each component works nicely. 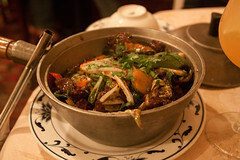 The beef was very flavorful and paired nicely with the sauce and veggies. The noodles worked both as an accompaniment to the beef, as their own item, crisping to the warm steel pot and chasing down the rest of the sauce. Again, another solid performer. Last to arrive was the Three Cup Chicken. A classic Taiwanese dish, this is named for the sauce which is primarily equal portions of soy sauce, rice wine, and sesame oil. The result is tender chunk of chicken with a rich flavor, a very crispy coating from the sauces, and a nice dose of basil, ginger, and garlic. This was quite enjoyable, although probably the weakest dish of the evening (by the time we finished it, it was a bit heavy, and a bit salty… I can see why a few online reviewers refer to the place as “A Salty Pebble”). 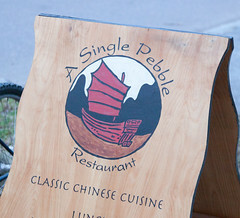 A Single Pebble stands out for me, since I’ve mentioned several times (like in my recent review of Shangri-La), that Northern New England seems to suffer from a lack of good Chinese places, even heavily westernized ones. But A Single Pebble has proven to me over several trips that it’s not just “good by Northern New England standards”, but it’s also one of the best Chinese places I’ve eaten in the United States. And from my several visits, it’s clear that we’re not yet done exploring A Single Pebble. Each time we’ve gone it has brought us new surprises, and we have yet to do their tasting menu, or tried the mock eel which many diners have praised. I’m looking forward to another trip back here.